Esdeath "Empire's Strongest, General Esdeath, Ice Queen"
Famous quote: Panicking leads to an early grave. 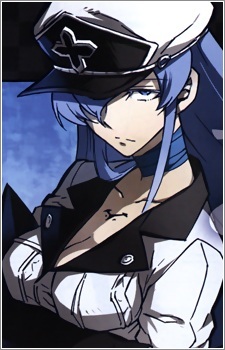 Esdeath is a high-ranking general of the Empire, and leader of the Jaegers. She enjoys torturing her enemies slowly, seen when she used her Teigu to put large blocks of ice in a cauldron so that the people inside would die slower and suffer more. Despite her sadistic actions, she is actually shown to have a compassionate heart when it comes to the lives of her men and others close to her. Her name in japanese, Esudesu, is a pun meaning "I am S" to show how sadistic she is. She is looking for love and although her expectations were high, when she saw Tatsumi's skills and smile she fell in love with him. In the last episode, Esdeath is defeated by Akame with a single cut to the chest. Before her death, Esdeath went over to Tatsumi's dead body, cuddled it one more time, and then froze the both of them. Esdeath remains floating in the wind with the one she loved. A great protagonist and story can give shape to a terrific anime, but sometimes an exceptional villain is what steals the show. These anime assassins tend to be slightly more capable than your average real life assassin...be very scared.